Have you wondered why the price of silver seems so undervalued? Those who have invested in this metal have gotten frustrated by its lack of an upsurge in recent years. But while we’ve found that silver price explosions usually follow those of gold, the reasons for the current dormant price are different — and they’re not exactly natural. Price manipulation in the markets is nothing new. This purposeful effort to try and artificially control prices of a precious metal, commodity or investment is often responsible for short-term market abnormalities. It is widely believed to happen with gold and silver prices — especially the latter since the market is smaller and thus easier to influence. And the latest to benefit from organized silver price suppression is the most powerful bank in the world. The COMEX silver fraud has lasted for more than 30 years, as the banks that are part of this derivatives exchange author their own story of modern silver price manipulation. In the past decade, it has helped JPMorgan conduct a scheme that has set them up to gain billions. It goes something like this: JPMorgan inherited an enormous short against silver when they absorbed the collapsing Bear Stearns (who had initially made the bet) in the 2008 financial crisis. 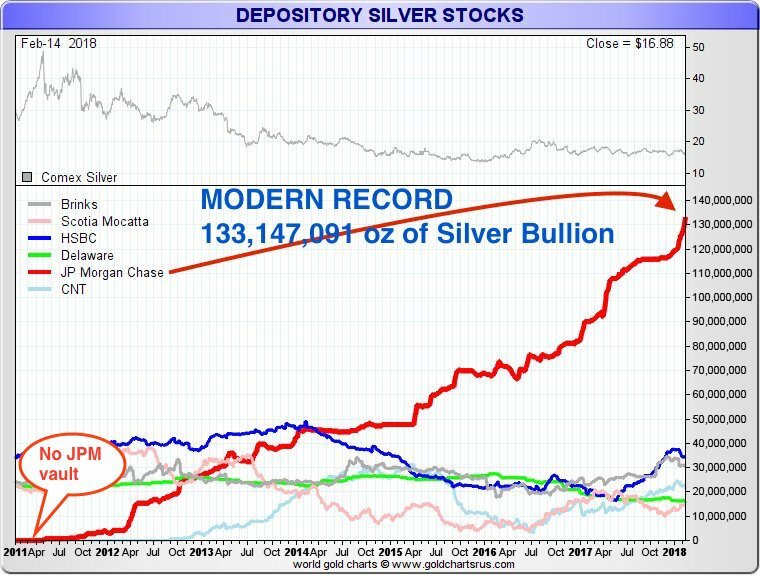 By continuing to short the stock on paper while simultaneously physically buying it, JPMorgan managed to cover that short on the cheap and accumulate the single greatest stockpile of physical silver ever amassed in the history of the world. It was such an airtight scheme that JPM has never, ever lost money shorting silver. Illegal? Sure. But when the largest and most prominent names in global finance all stand to gain millions and regulatory authorities are bought and paid for, who’s going to stop them? The silver lining in all of this is that the most powerful bank in the world now owns more silver than any other entity ever has. Sooner or later you can bet they’re going to let the price of silver run higher. As high as they possibly can. And until they do, you can bet alongside them, to profit from the same trade, at bargain basement prices. With the COMEX silver manipulation, the list of those keeping the real facts in the dark is a mile long. Pitted against the insiders intent on keeping the COMEX silver fraud in the dark are mining companies and silver investors, the vast majority of which don’t have a clue about the fraud. In this group are those who denied the silver manipulation early on and can’t face up to admitting they were wrong even as compelling new data proving fraud roll in. The surest proof of the COMEX silver manipulation fraud is the refusal of the insiders to openly discuss it. Furthermore, the U.S. Commodity Futures Trading Commission (CFTC) refuses to answer or refute allegations, like JPMorgan never taking a loss in shorting COMEX silver and the fact that JPMorgan has been the leading short seller while amassing more physical silver than any entity in history. Of course, the CFTC has been denying the fraud since 1986, so why would they admit its existence now? And JPMorgan and the CME Group are so intent on keeping the real facts under wraps that both shrug off public allegations of criminal behavior that would normally bring charges of libel and slander were the allegations not true. Let me be clear: both JPMorgan and the CME Group are stone-cold crooks when it comes to silver.